Author: Thompson, Craig Set In . . . 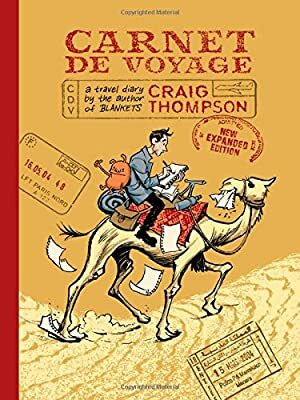 Riding the international success of Blankets, Craig Thompson sets out on a tour across Europe and Morocco, promoting the various European editions of his book and beginning research for his next graphic novel, Habibi. Carnet de Voyage is a gorgeous sketchbook diary of his travels as he finds intellectual and spiritual stimulation during the day-to-day work of being an author. From wandering around Paris and Barcelona between events, to navigating markets in Fez and fleeing tourist traps in Marrakesh, we see glimpses of each place, rendered in Thompson’s exquisite ink line. While desert landscapes and crowded street scenes flow across the pages, the sketchbook is packed first and foremost with people?travelers passing through, the friends and lovers he meets along the way, distant figures of old friends and other cartoonists who freely weave in and out of his subconscious. This expanded edition also includes a new epilogue drawn from his most recent European book tour, including several familiar faces and Thompson’s reflections on keeping a sketchbook. Carnet de Voyage is a casual yet intimate portrait of a celebrated cartoonist at a moment between works?surprisingly open and candid in his observations and revelations.